Dreaming in English picks up where Laura Fitzgerald's debut novel Veil of Roses left off. Tamila Soroush came to America from Iran to find a husband. There were no opportunities in Iran and the lure of America, where her sister was living already, was too much for her to ignore. Following a whirlwind courtship and a last-minute marriage to Ike Hanson, Tamila is ready to embrace America with open arms. Unfortunately, it won't be that easy. Ike's family is shocked at his sudden decision and is less than welcoming to her. Tamila's former American boyfriends keep surfacing, and not all of them wish her well in her new marriage. Ike's ex-girlfriend, and apparently the previous love of his life, has resurfaced and is intent on making Tamila's new marriage miserable. With her immigration interview looming and all of these obstacles in her way, will her luck run out? 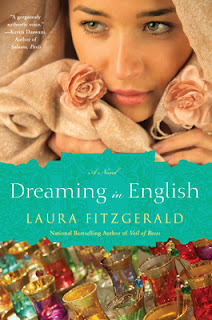 Dreaming in English was an incredibly interesting novel. I especially enjoyed Tamila's reflections on freedom and what it meant to her to be able to become an American citizen. We so often take our freedom and privileges for granted, and it was interesting to be presented with an additional perspective. As Tamila attempts to learn English and to immerse herself in the American culture that surrounds her, we as readers can almost feel how much this means to her. I also appreciated that this was a commentary on marriage. Anyone can walk into a chapel in Vegas and get married, but Dreaming in English reflects on what it means to keep a new marriage together. I've long felt that the strongest marriages are the ones where the couple works through their misunderstandings and differences in order to come to a better understanding of one another and of themselves. This book examines this issue. My only complaint would be that I found the ending to be a bit overdramatic, but that did not detract from my overall enjoyment of the novel. On the whole I found it to be well-written and enjoyable, filled with characters that I really came to care about. 1. *Mandatory Entry* Leave me a comment letting me know that you would like to win this book. Please include your e-mail address so that I can contact you if you win. No e-mail= no entry! 2. *Bonus Entry* Become a follower of this blog through Google Friend Connect and leave me a comment to let me know that you now follow. Already a follower? Great! Just leave me a comment to let me know. 3. *Bonus Entry* Spread the word about this contest in some way. Facebook it, Tweet it, blog about it or post it on your sidebar. It doesn't matter how you choose to do it, just leave me a separate comment to let me know what you did. This contest runs until February 18, 2011 at midnight and is open to Canadian and US mailing addresses only. The winner will be notified by e-mail and will have 48 hours to respond. Good luck! Hopping thru and would definitely love to win the book. nice review. Sounds like a great book. Would love to read this and her debut! I'd love to win this book, thanks for hosting! This book sounds quite interesting and I'd love to read about Tamila's experiences in America. Please enter me in your giveaway. I'm a Google Friend Connect follower of your blog! what a lovely book and cover. Hm...you have me curious about the ending now...I understand what you are saying about strong marriages resulting from weathering storms together...thanks for the review! I'd love a chance to read this book! Wow. This sounds really good. I like when you described what she brings to the table about marriage. Great review. Oh, I haven't heard of this one before. It sounds really good! I would love to enter the giveaway. Also. a gfc follower. Hi Jonita, please enter me in the drawing - Dreaming in English sounds wonderful and I just love the cover. Please pick me for "Dreaming in English." I loved Veil of Roses (and my book club even got to do an author chat with Laura). Would love to win this book and see what's next for Tami and Ike! I already stalk... I mean follow you via google friend connect. I also liked Veil of Roses and I'd love to read this next book.